non-repeating patterns, multi-color techniques, fine threads, small hooks, detailed shaping and refined finishing. One size fits most - teens to adults. Pattern written for 21" head circumference but can be easily adjusted to fit any size. Measures 5-1/2" at widest part. 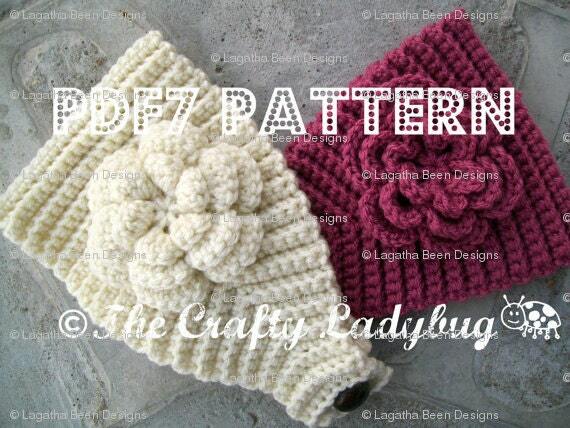 You will also receive pdf instructions for my super easy flower to complete this fashionable and trendy headband. Stitches you need to know are chain, single crochet, double crochet, slip stitch, and basic knowledge of American crochet terms. Materials needed: Worsted weight yarn and crochet hook size needed to obtain correct gauge, stitch markers, yarn needle, and one large button..
Find and "like" me on Facebook, The Crafty Ladybug, for periodic specials, discount codes, and giveaways! Please see updated shop policies and thanks for visiting my shop! Very easy pattern to follow. Works up very pretty. Just what I was looking for. This is so cute! I wanted to add it to my collection so when the spirit moves me I have the pattern already, thank you! I accept Paypal, payments by credit card, and Etsy direct checkout. Payments by eCheck are NO longer accepted due to the clever nature of some customers receiving their digital items and then cancelling their eCheck payment. If you are here shopping for a pattern, I am under the assumption that you have some basic knowlege of crochet stitches. If not, please take the time to visit You Tube or some other source for instructions. I am not here to teach you how to crochet. However, I am here to assist you with any problems you may encounter with any of my patterns. Please contact me for problems. Please do not assume that all pattern designers write patterns exactly the same as some of your favorite designers. I am not normal! I do not crochet my "circles" (meaning hats) in the normal way most crocheters do. I stagger my increases so I won't have a hexagon or octogon looking circle. This does not make my pattern writing wrong by any means----just makes me different! So, please keep that in mind when leaving feedback telling all my future customers that my pattern could have been written in "simpler terms". This is just how I write my patterns! Please DO NOT redistribute this pattern, in part or in whole, in any form or fashion. I spend a lot of time creating these beautiful patterns, so please comply with this request. My images are all copyright protected by both myself and the photographer who provided them. Again, please DO NOT use them to sell your finished items.